Molded, open-bottom design holds variety of tools. Fits belts up to 2-3/4" wide. Quick-release buckle. 2" wide belt. Double row of 12 waist pockets. Two Polypropylene leather hammer loops. Heavy duty cotton canvas; machine washable. Cradle design keeps hammer secure, swing feature keeps hammer vertical. Heavy-duty leather. Fits belts up to 2-3/4" wide. 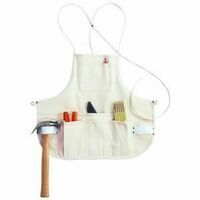 CLC Bib Apron, 29 - 46 in Waist, 12 Pockets, 18 in Overall Length, 19 in Overall Width, Cotton Canvas, White, Includes: (2) Hammer Loops, For Pencils, Pens and Small Tools The deluxe quality tool holder for pliers, snips or pruning shears is made of heavy-duty leather with heavy-duty stitching and easily holds tools up to 10" long; fits narrow-type hand tools; molded leather retains shape; fit belts up to 2-1/4" wide. Made of heavy-duty canvas fabric. Plastic reinforced zipper. Wide bottom to sit upright. Size: 10 in. W x 3 in. D x 8 in. H. Made of 600 poly ripstop fabric. Spring steel belt clip. Outside loops. Versatile 3-way attachment, hang, strap or clip on workbelts pants, web suspenders, and work aprons. Securely holds small tools or accessories like pliers, mini-flashlights and screwdrivers; height is 7", width is 3-1/4". Molded heavy-duty leather retains shape and holds a 16' - 30' tape. Fits belts up to 2-3/4" wide, safety snap included. Made of Poly Rip Stop/600D poly material and has a reinforced plastic backing. Perfect for holding utility knives, small flashlights or markers. Elastic channel holds screwdriver. Spring steel clip to attach to belt. Pouch measures 8.75 in x 3.25 in. Fits most curved-handle knives. Fiber liner resists cut-through. Fits Belts up to 2-3/4" wide. Patented integrated fastening system designed exclusively for use with specially-equipped IRWIN "VISE-GRIP" pliers; work safer by attaching clip to pliers handle to help prevent accidental drops when working in elevated conditions; lanyard allows the user to find the right tool faster when stored in a crowded toolbox. Army pistol-type construction, 2-1/4" wide. Heavy-duty, extra strength 2" wide work suspenders. Adjustable to fit most sizes. Heavy-duty front and rear clips, comfortable elastic rear straps. Durable clip hangs on toolbelts, belt loops etc. 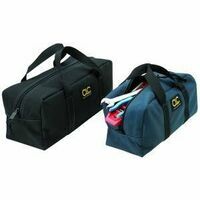 Carry and organize all miscellaneous parts, tools and accessories. 3 convenient sizes: 9" x 7", 7" x 6" and 6" x 5". Heavy-duty, extra strength 2" wide work suspenders. Adjustable to fit most sizes. Heavy-duty front and rear clips, comfortable elastic rear straps. Ballistic poly material provides strength and durability while steel loop cradle helps stabilize hammer and added padding helps keeps handle away from body. Fits belts to 2-3/4" wide. Two bib pad and pencil pockets, 1 waist pocket, overall length 36". Machine washable . One size fits most. 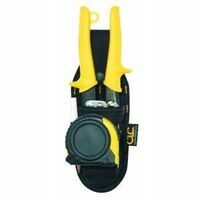 CLC Utility Knife/Plier Holder, Heavy Duty, Suitable For Use With: Belts Upto 2 in Wide, 2 in Width, 3-1/4 in Depth, 8-1/4 in Height, Polyester Fabric, Black 1-3/4" Embossed top grain leather, steel single tongue buckle. Conveniently holds most cordless drills; ball-capped hook safely holds your drill; hook storable in a closed position when not in use; features 2 bit pockets and an elastic sleeve to help organize bit and accessories; fits belts to 2-3/4" wide. Heavy-duty, extra strength 2" wide work suspenders. Adjustable to fit most sizes. Heavy-duty front and rear clips, comfortable elastic rear straps. Made of 600 poly ripstop fabric. Holds small tools, pencils, flashlights and more. Size: 5 in. W x 2 in. D x 9 in. Made of 600 poly ripstop fabric. Web loop for tape rolls. Cell phone pocket fits iPhone? 6. Mesh windows. Assorted sizes and colors. Brown: 5.7 in. W x 4.8 in. H. Gray: 6.7 in. W. x 5.7 in. H. Black: 8.7 in. W x 6.7 in. H. Heavy-duty, extra strength 2" wide work suspenders. Adjustable to fit most sizes. Heavy-duty front and rear clips, comfortable elastic rear straps. Heavy-duty, extra strength 2" wide work suspenders. Adjustable to fit most sizes. Heavy-duty front and rear clips, comfortable elastic rear straps. 18 oz. Duckwear canvas; quick release belt fits up to 52" waists; 13 pockets to hold tools and pens; bar tacked seams. Size: 23" W x 9.5" H; 27" to 54" waist size. No.10 canvas bag with strong zipper; convenient storage for pliers, wrenches and other tools. Heavy-duty poly fabric contruction provides strength and durability with steel measuring tape clip and webbing loop. Fits belts to 2-3/4-inch wide, tool holder has multiple pockets designed for pliers, snips, cutters, pencils or markers. 4 pockets on front, 3 pockets on back and 3 inner pockets. Size: 12" x 7". Ideal for staying organized. It can hold utility knives, small flashlights and markers. It's made to last with heavy duty poly ripstop material. It features FlapFit?, a padded flap that easily attaches over a belt without removing it or in a pants pocket. Tough ballistic nylon with wide mouth for easy access, padded sides and bottom. 6 outside pockets and 15 inside pockets; zipper closure. 8" wide x 13" long x 8-1/2" tall. Tools not included. 4 pockets and one padded pocket to fit most compact cell phones; attach to belt with snap closure or carry securely in pocket with wide padded flap; webbing slot for small flashlights or other tools; electrical tape sling and made of polyester fabric. High visibility 3/4" webbing with internal shock cord; heavy-duty, extra length lanyard; 2 carabiners for secure belt and tool attachment; convenient webbing loop for belt attachment; rated for tools up to 6 lbs. Made of Poly Ripstop/600D poly material. This holster has 5 pockets to hold small hand tools. The adjustable belt can fit up to a 52 in. waist and has a quick release buckle and a tape clip built into it. There is also a heavy web hammer loop. Two main nail/tool pockets, smaller pockets fits pliers, nail sets and pencils. 2" polyweb belt with quick release buckle. Adjustable Strap and Quick-Release Buckle holds drill securely in place; heavy-duty poly material provides strength and durability; hook & loop back keeps strap back when not in use; angled holster provides better drill balance; added pockets and elastic loops hold bits, chuck key, drivers, etc; fits belts to 2-3/4" wide. Made of polyester fabric and ballistic nylon binding. 2 main nail and tool pockets, 3 small pockets for pliers, pencils, etc. 2" wide web belt. Made of polyester fabric. Holds most brands of T-handle drills. Multiple outer pockets and sleeves for complete bit organization. Safety strap with quick release buckle. Made of heavy-duty Duckwear canvas to absorb tool oil. 11 assorted pockets. Fits 6 mm to 32 mm wrench sets. Opened: 18 in. W x 17.5 in. H. Made of polyester fabric and ballistic nylon binging. 4 main nail and tool pockets, 3 small pockets and 1 center pocket holds a tape or other tools. 2" wide web belt with steel buckle. Belt is heavy duty suede leather with quick release buckle and steel hammer loop on a 2" polyweb belt. 5 main nail/tool pockets, 3 smaller pockets fit pliers, nail sets and pencils. Heavy-duty double layer lightweight fabric will not rot, crack, harden or mildew. Foam padding, 2" Double tongue metal roller buckle. Grip Strip fastening system hold pouches securely in place. 12" standard Big Mouth? opens wide for easy access to bags contents. 8 multi-use pockets inside and 6 outside organize tools and accessories. Padded reinforced web carrying handles. 12"L x 8-1/2"W x 8"H. Heavy-duty poly fabric construction provides strength and durability. Pouch has a rear flap that slips into back pocket or snap closure to attach to two inch wide belt. It has a large main pocket, the padded cell phone holder has hook and loop flap closure to help secure phone, web loops and sleeve pockets provide multiple storage options. The outside web loop is for a small flashlight or tool, tape strap plus an extra hidden pocket. 18 oz. Duckwear canvas; full coverage apron for home or shop; quick release belt that fits up to 52" waists; 16 pockets: 13 on waist, 3 on bib; padded shoulder straps, dual hammer loops. Size: 23" W x 23.5" H. Flap fit back fits inside pants pocket or over the belt. Made of Poly Ripstop/600D poly material. 4 inch notebook pocket, tape measure clips and 4 open bottom pockets for long tools. Made of single wall 600 poly ripstop fabric. Super-wide "Dr.'s Bag" opening. Heavy-duty poly material provides strength and durability with adjustable strap and quick release buckle holds drill securely in place. Hook and loop backing keeps strap back when not in use, angled holster provides better drill balance, added pockets and elastic loops hold bits, chuck key, drivers. Pouch will fit belts to 2-3/4 inches wide. Steel double tongue roller buckle. Front cut down design for bending comfort. Made of top grain leather. Four main nail/tool pockets, 6 smaller pockets fits pliers, nail sets and pencils. Steel hammer loops and metal clip holds all measuring tape sizes. Fits belts up to 2" wide. Main zippered compartment with 7 internal pockets; 2 external pockets and 5 web loops; carabiner for keys, small tools, etc. ; made of polyester fabric. Comes with 3 interchangeable tool ends for quick tool changes; high visibility 3/4" webbing with internal shock cord; 10" webbing loop with dual-channel lock for secure tool attachment; cinch or carabiner belt attachment; convenient webbing loop for belt attachment; rated for tools up to 6 lbs. Steel double tongue roller buckle. Front cut down design for bending comfort. Made of top grain leather. Top grain embossed leather two inches wide with steel single tongue roller buckle. Premium quality; adjustable to fit all sizes; 2" wide foam-filled comfort pads; heavy duty clips on front and rear; comfortable heavy-duty straps. Made of heavy-duty Duckwear canvas. Padded adjustable shoulder straps. Full coverage apron for home or shop. Quick release belt fits waists up to 52 in. Keeps fasteners, tools and other equipment close at hand for easy retrieval. The vertical storage design makes it ideal for holding taller tools, batteries and other items. Its heavy-duty construction holds up to regular use and is immune to rust so you can use it out in the rain. Rugged, lightweight ballistic poly fabric; innovative handle design for easy adjustment and carrying; 3 main nail and tool pockets; 7 smaller pockets for pliers, pencils, nail sets, etc. ; metal clip holds all measuring tape sizes; 2" wide web belt with single tongue roller buckle. Made of polyester fabric and ballistic nylon binging. 4 main nail and tool pockets, 6 small pockets and center pocket holds tape or other tools. 2" wide web belt with steel buckle. Heavy-duty poly fabric construction provides strength and durability. The pouch has a main pocket with double pull zipper and small internal pockets provide multiple storage options. Small flap pocket with zipper to secure change, keys, or small phone, medium-sized pocket with hook and loop flap closure for added storage, clips onto pants or pockets or fits belt two inches wide. Heavy-duty double layer, lightweight fabric will not rot, crack, harden or mildew. Foam padding. 2" double tongue metal roller buckle. Grip strip fastening system hold pouches securely in place. Made of polyester fabric and ballistic nylon binding. 2 main pockets for tools/nail, 2 additional pockets and 6 small pockets for hand tools, pencils and nail sets. Pry bar or combination square holder. CLC Tool Pouch, Medium, Utility, Series: Ziptop, Suitable For Use With: Belts to 2-1/4 in Width, Black Poly ripstop/600D poly material. Super-wide in. Dr's bag opening. 16 pockets: 6 exterior, 10 interior. Padded ripstop bottom. Side pull handles. Heavy-duty poly fabric construction includes reinforced edges for extra wear. The pouch has a large main pocket and smaller front pocket for convenient access to parts or tools. Web loops and sleeve pockets provide multiple storage options, handy flashlight or large tool sleeve, electrical tape strap plus carabineer for keys. Rear clip or attach to belt up to 2-3/4" wide. Four main nail/tool pockets, 6 smaller pockets fits pliers, nail sets and pencils. Leather holder fits up to 30' measuring tape, steel hammer loops. Leather combination square holder. 2" polyweb belt. Designed to transfer weight from waist to shoulders. Fully adjustable length, front and back to fit all sizes. Heavy duty padding for user comfort. Heavy duty nylon web for extra strength. Convenient quick fastening system. Poly ripstop / 600d poly material; 5 pockets: 4 exterior (1 with zipper), 12 tool loops interior; steel handle w/foam rubber grip. Size: 12" W x 10" D x 11" H.
Framer's nail and tool bag made of polyester fabric and ballistic nylon binding. 4 pockets for nails, tools, etc., 2" polyweb belt with quick release buckle, speed square holder, metal clip holds all measuring tape sizes, steel hammer loop. Heavy-duty Leather. Flat type Standard Drywall Tool Pouch. Double-row main pockets designed for drywaller's hand tools. Leather sharpening stone holder. Leather holder fits up to 30' measuring tape. Steel hammered loop. 16" large Big Mouth? opens wide for easy access to bags contents. 12 multi-use pockets inside and 10 outside organize tools and accessories. Padded reinforced web carrying handles, adjustable shoulder straps. 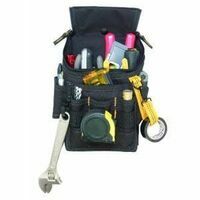 16"L x 8-1/2"W x 10"H.
Large, gusset-style pockets provide extra capacity and easy access, 5-main pockets and inner flat pocket for a variety of tools, nails and parts and steel loop hammer holder and tape measure clip. Pouch handle allows for simple belt adjustments, easy one-hand carrying and convenient on-hook storage, 2-inch wide web belt with double-tongue roller buckle helps keep belt stable. Made of heavy duty 1680D 2-ply poly fabric. The large capacity interior pouch includes a pocket for a speed square. Includes a heavy duty web hammer loop and a couple of exterior tool loop holders. Fits on most work belts. Made of polyester fabric and ballistic nylon binding. 4 main nail and tool pockets, 2 small pockets and 4 large screwdriver holders. Electrical tape strap, metal measuring tape clip and tool snap. The 12" pop-open design allows for easy access to tools and parts and is made of heavy-duty poly fabric; includes base pads to protect bottom and an adjustable shoulder strap. There are 9-interior pockets including one-zippered pocket for security, 20-exterior with one flap-covered pocket with hook and loop closure. Heavy-duty poly material cover with slip-resistant spine is durable and easy to carry; full zipper closure keeps loose articles secure; built-in calculator solar power keeps it ready for quick calculations; spring clip holds writing pad and notes in place; multiple pockets and sleeves for business cards, pens, and loose documents. LoadBear? stretch suspension for comfort. Cell phone pocket fits up to an iPhone? 6. Breathable foam construction to stay cool. Clips to any D ring on most belts. Heavy-duty double layer, lightweight fabric will not rot, crack, harden or mildew. Foam padding. 2" double tongue metal roller buckle. Grip strip fastening system hold pouches securely in place. Custom Leathercraft Tool Bag, Heavy Duty, Series: Tradesman, 16 in Length, Hook and Loop Closure, Poly Fabric, Black, 33 Pockets, Padded Web Handle Reversed heavy-duty leather. Two large capacity main nail/tool pockets; 6 Smaller pockets fit pencils, nail sets, pliers, etc. Fits belts up to 2 3/4" wide; 2 Steel hammer loops. 9 pockets outside and 8 inside to organize a wide range of tools and accessories. Main pocket with web loops to accommodate large handle tools. 13-1/2" x 9" Multi-compartment plastic tray included, stores into middle compartment for easy access to the rest of bag contents. Padded carrying handles and adjustable shoulder strap. Metal tool snap and electrical tape strap. 16"L x 9"W x 9"H. Made of Poly rig Stop/600D Poly material. 2 large capacity pouches for holding medium and small hand tools. Has 11 pockets for holding tools, nails and other small parts. There is a small pouch that can hold a tape measure or use it to hold nails and other small parts. Heavy web hammer loop and steel buckle belt with monster grommets. Fits waists up to 52 in. Size: 21 in. W x 4.5 in. D x 10 in. H. Double wall 600 poly ripstop fabric. Super-wide "Dr.'s Bag" opening. Removable padded shoulder strap. Rugged, lightweight ballistic poly fabric. Stay-open features on main pockets with curved bottom make grasping nails, fasteners or parts a breeze. 3 main pockets for tools and nails and 6 smaller pockets for hand tools, pencils and nail sets. Steel hammer holder and metal clip positioned for quick access and easy tool return to keep your motion uninterrupted. 10 Pockets inside and 13 pockets outside to organize tools and accessories. 10" x 3" Multi-compartment plastic tray to organize small parts, recessed on top for easy access. Reinforced web carrying handles and adjustable shoulder strap. Overall dimensions: 16"L x 8"W x 11"H. Heavy-duty 1680d 2-ply poly material. Reinforced diamond PVC bottom holds bag upright. Includes 2 in. web belt with monster grommets and fits up to a 52 in. waist. Three-way carrying system, belt, handle or shoulder strap (shoulder strap not included). Tape measure clip, carabineer, t-chain tape roll holder. Bag is heavy duty leather with a double gusset front pocket for extra capacity and easy access, 4 main pockets, 6 smaller pockets and sleeves for nails or other small tools and web loop for pry bar. The 2" wide web belt with double-tongue roller buckle helps keep belt stable and a patented pouch handle allows for simple belt adjustments and easy one hand carrying. Box-shaped design prevents tipping. 7" x 5-1/2" multi-compartment plastic tray included to organize small parts. Pockets for drill bits, tips and electrical tap strap. 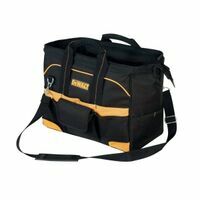 Bag has a double gusset front pocket provides extra capacity and easy access, 4 main pockets, 6 smaller pockets and sleeves for nails or other small tools and web loop for pry bar. The 2" wide web belt with double-tongue roller buckle helps keep belt stable and a patented pouch handle allows for simple belt adjustments and easy one hand carrying. Reversed heavy-duty leather; gussets keep front pockets wide open for greater access; 2 large capacity main nail and tool pockets; 2 additional upper pockets; 6 smaller pockets fit pencils, nail sets, pliers, etc. ; steel hammer loop; metal clip holds all sizes of measuring tapes. 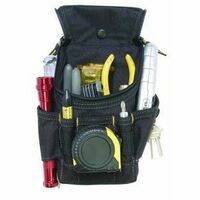 CLC Electrician's Tool Pouch, Zippered, 21 Pockets, Polyester Fabric, Black 20% Poly; 10% Ferric; 15% PP; 45% PVC and 10% EPE Foam. Poly rip stop/600d poly material. Large capacity pouches are adjustable. Steel buckle belt with monster grommets fits waists up to 51 in. Heavy web hammer loop. Apron is made of heavy duty suede leather with a 2" wide web belt that has a double-tongue roller buckle which helps keep belt stable, double-gusset front pocket provides extra capacity and easy access, 5 main pockets, 7 smaller pockets and sleeves, center pocket for tape measure or extra nails, web loop for pry bar, and pouch handle allows for simple belt adjustments and easy one handed carrying. Made of polyester fabric and ballistic nylon binging. 6 main nail and tool pockets and 10 small pockets. Padded comfort belt with double adjustment. Reversed heavy duty leather; 4 main nail and tool pockets; 6 smaller pockets fit pliers, nail sets, pencils, etc. ; double gussets keep front pockets wide open for easy access; center pocket for tape, nails or other tools; molded leather holder fits combination square; metal swinging hammer loop; 2" poly web belt with roller buckle. Reinforced interior bottom panel and heavy duty stitching and bar tacking at stress points. 18" 'MegaMouth' opens wide for easy access. 12 multi-use pockets inside and 13 outside organize tools and accessories. Internal metal frame holds bag open, large interior to carry power tools, circular saws and hard hats. Padded handles and adjustable shoulder strap. 18"L x 11"W x 12"H. Cordura? Ballistic fabric. Barrel-bottom, super capacity pouch. Single body construction. Double layer pouch bottom. Speed square pocket. Heavy-duty web hammer loop. 3 vertical tool pockets. Made of polyester fabric and ballistic nylon binging. Completely adjustable, padded suspenders engineered to hold and distribute weight comfortably. 3" wide padded comfort belt with steel roller buckle. Carry handle design provides for adjustments and storage without spilling contents. Fits waist sizes 29"-46". 21 Multi-use pockets to organize a wide range of tools and accessories. Adjustable, padded shoulder strap with metal hardware. Sturdy metal handle bar with foam grip for easy carrying. Wide open space below handle for easy access to tool carrier's main compartment. 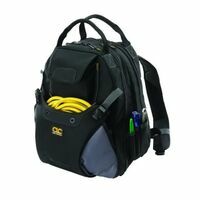 14"L x 11"W x 11"H . Built-in LED light can be easily directed at work area or into tool bag to help identify tools and parts; 3 levels of light output allow adjustment for wide area illumination or close-up work; 11 multi-use pockets inside and 18 outside to help you better organize your tools; padded web carrying handles and adjustable shoulder strap; base pad feet to help reduce wear and abrasion; powered by (2) AAA batteries, included. Specifically designed to be durable enough to withstand tough jobsite conditions. The cooler utilizes double insulation and a food-grade leak proof liner to keep ice cold for 24 hours without leaking. Additionally, Milwaukee constructed the cooler with 1680D ballistic material base and heavy duty metal zippers for a longer life. A tape measure clip with a bottle opener provides ultimate versatility. Lastly, Milwaukee implemented a tech pocket and dry storage compartment to make this cooler a versatile jobsite storage solution. 18 oz. Duckwear canvas; mesh shoulder and full mesh back to keep you cool; 14 pockets to hold tools, pencils and pens; 2 quick release removable, adjustable pockets; web hammer loop. 1680 heavy-duty poly fabric. Open tote with diamond PVC reinforced bottom. Includes plastic small parts tray. Removable padded shoulder strap. 1680 heavy-duty poly fabric. Molded, waterproof bottom. Removable padded shoulder strap. StayPut? handle grips. Integrated back support and work suspenders. 24 total pockets for nail and tool storage. Heavy duty fabric for maximum durability. Moisture-wicking mesh liner; 3 boxed front nail pouches and rafter square pocket. Work Suspenders feature Custom molded,'Dead On' heavy duty logo clip; clips to tool belt or pants; 2" webbing and elastic straps and cell phone holster. Bag has a 14" open-top design with collapsible bar handle and is made of heavy duty poly fabric with base pads to protect bottom. Includes 16 exterior pockets, 10 interior pockets with 2 flap-covered pockets and one large zippered pocket for security, adjustable, non-slip padded shoulder strap and padded bar handle. 18 oz. Duckwear canvas; mesh shoulder and full mesh back to keep you cool; 14 pockets to hold tools, pencils and pens; 2 quick release removable, adjustable pockets; web hammer loop. LED light handle can be easily directed at work area or into tool carrier to help identify tools and parts; 3-levels of light output allow adjustment for wide area illumination or close-up work; ergonomic handle design helps reduce stress on hand and wrist; convenient open compartment for power tools and accessories; 22 multi-use pockets to help organize a wide variety of hand tools; padded, adjustable shoulder strap for easy carrying; base pad feet to help reduce wear and abrasion; powered by (2) AAA batteries, included. 14 pockets inside and 23 pockets outside to organize tools and accessories; 13-1/2" x 3" multi-compartment plastic tray to organize small parts on top for easy access; padded web carrying handles and adjustable shoulder strap; abrasion resistant rubber feet; large zippered outside pocket and heavy-duty tape clip. 18"L x 11"W x 11"H. Removable metal frame partition slides into place to customize tool box to your storage needs. Wide open space below handle for easy access to tool carrier's main compartment. Sturdy metal handle bar with molded foam grip for easy carrying. Multi-use pockets to organize a wide range of tools and accessories. Adjustable, padded shoulder strap with metal hardware. 20"L x 11"H x 11"D.
Made of heavy-duty leather. 4 main reversed nail/tool pockets, 6 smaller pockets fit pliers, nail sets, and pencils. (1) center pocket fits up to 30' measuring tape, and (1) combination square pocket. Metal snap-in hammer loop, 2" heavy-duty leather belt. Rivets, buckle and loops with antique brass finish. Does not include tools. The 16" large open-mouth bag has 14 interior pockets, small parts bin, padded shoulder strap and reflective material; has reinforced water-resistant bottom. Heavy-duty, extra strength 2" wide work suspenders. Adjustable to fit most sizes. Heavy-duty front and rear clips, comfortable elastic rear straps. Use your DeWalt 20V MAX Lithium ion battery and our internal custom design battery dock as a USB charging source. Battery not included. USB charging battery dock simultaneously charge 2 devices via USB ports; 3 internal charging wall pockets fit tablet, phone and/or camera; low battery cut-off protection monitors battery voltage to avoid battery charge over-depletion; 20 multi-use pockets and 3 outside help organize a wide variety of hand tools. Made of 1680 heavy-duty poly fabric. HV retro-reflective meets EN1150 worldwide standard. Infinity belt fits up to a 52 in. waist. Barrel-bottom, super capacity pouches. Reinforced pouch bottoms. Padded back support belt. Adjustable pouch system. Speed square pocket. Dual hammer loops. Steel buckle and monster grommets. The 18" pop-open design allows for easy access to tools and parts and is made of heavy duty poly fabric, includes base pads to protect bottom and an adjustable shoulder strap. There are 26 exterior pockets including 2 flap-covered pockets, 14 interior pockets including one zippered pocket to secure valuables, utility knife pocket, measuring tape clip, easy double pull and heavy duty zipper. Rrugged, lightweight ballistic poly fabric; easy carry handle design provides simple adjustments, easy carrying and storage of apron without spilling contents; gussets keep front pockets wide open for greater access; bottoms of main pockets are reinforced with PVC material for better resistance to abrasion; built-in utility knife pocket helps prevent accidental pouch punctures; prybar or combination square holders; 5" wide padded comfort belt with double tongue steel roller buckle. 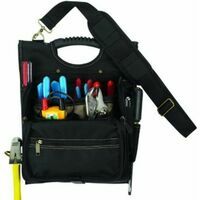 CLC Combo Tool Belt, Electrician, 3 in, 29 - 46 in Waist, 20 Pockets, Ballistic Polyester, Black, Includes: 3 in Padded Comfort Belt, For Connectors and Tools 1680 heavy-duty poly fabric. Molded, waterproof bottom. Removable padded shoulder strap. StayPut? handle grips. Side pull handles. Waterproof zipper. ID window. 43 Pockets inside and 7 pockets outside to organize tools and accessories. Large center compartment to carry multiple power tools and accessories and separate outside two compartments. Zippered side panels prevent spillage of tools when carrying or storing carrier. Vertical tool pockets keep them in sight for quick access. 18"L x 7"W x 14"H. Unique, padded suspenders engineered to carry loads comfortably and distribute weight evenly without strain on lower back and hips. Easy carry handle design provides for simple adjustments and easy storage without spilling contents. New and improved pockets with more capacity and easy access to contents. Metal hook to carry cordless drill, nail guns or other power tools. 5" Wide padded comfort belt with double tongue steel roller buckle. Bottoms of main pockets are reinforced with PVC material for better resistance to abrasion. Heavy-duty, extra strength 2" wide work suspenders. Adjustable to fit most sizes. Heavy-duty front and rear clips, comfortable elastic rear straps. 1680 heavy-duty poly fabric. Gatemouth "Dr.'s bag" opening. Diamond PVC reinforced bottom. Removable padded shoulder strap. Double layer or rugged, lightweight ballistic poly fabric with easy carry handle design provides for simple adjustments, easy carrying and storage of apron with spilling contents. Gussets keep front pockets wide open for greater access and bottoms of main pockets are reinforced with PVC material for better resistance to abrasion. Built-in utility knife pocket helps prevent accidental pouch punctures. 5" wide padded comfort belt with double tongue steel roller buckle. Fits waist sizes 29"-46". Heavy-duty 1680d poly material; LoadBear stretch suspension for comfort; speed square pocket; adjustable velcro pouches; steel buckle belt with monster grommets; fits waists up to 52". Double layer or rugged, lightweight ballistic poly fabric; adjustable and padded suspenders to hold and distribute weight comfortably; main pockets reinforced on bottom with PVC material for better resistance; 5" wide padded comfort belt with steel roller bucket. Features an impact resistant molded base that fully integrates with all PACKOUT? system components. Constructed with 1680D ballistic material and all metal hardware. Designed for ulitmate durability while the included padded shoulder strap and durable over molded handle allows for easy transport. Made of 1680 Denier heavy-weight poly fabric; "LoadBear" stretch suspension; infinity belt fits up to 52"; single body construction (no joints to fail); barrel bottom pouches for extra capacity. The Low-Profile backpack is durable with a low profile design. The backpack is constructed of 1680D ballistic material and rugged metal zippers providing unmatched durability for a longer life. With 22 pockets including a padded electronic sleeve, the backpack provides ultimate organization. The padded and breathable load-bearing harness evenly distributes the weight for unsurpassed comfort and jobsite performance with 2x more padding than competitive units. Made of 1680 denier heavy-weight poly fabric. LoadBear? stretch suspension. Infinity belt fits up to 52 in. waist. Single body construction (no joints to fail). Barrel bottom pouches for extra capacity. Heavy-duty 1680d poly material; molded waterproof rubber bottom; water resistant zipper; 17 pockets: 10 exterior, 7 interior; StayPut handle grips; removable padded shoulder strap; side pull handles; ID window. Size: 18" W x 11" D x 12" H.
Tool Works Tool Back Pack, Deluxe, 13-1/2 in Length, 16 in Width, 8-1/2 in Depth, Zippered Closure, Polyester, Black, 48 Pockets, Padded Web Handle Apron has large, gusset style pockets, 7 main pockets with 13 smaller pockets and sleeves. Pouch handle allows for simple belt adjustments and easy one hand carrying. Fully adjustable, padded yoke style suspenders with Dri-Lex for added comfort, includes extra pocket and neoprene padded cell phone holder, 5" padded belt with Dri-Lex and double tongue roller buckle for added comfort and better belt stability. Made of 1680 Denier heavy-weight poly fabric; "LoadBear" stretch suspension; infinity belt fits up to 52"; single body construction (no joints to fail); barrel bottom pouches for extra capacity. Easy carry handle design provides simple adjustments, easy carrying and storage of apron without spilling contents. Sta-Open feature on main reversed pockets. 9 Main pockets for tools/nails. 6 Smaller pockets for screwdrivers, cutters, pliers, pencils. Speed Square and pry bar holders. 2 Steel hammer loops. Metal clip holds all measuring tape sizes. 5" Wide padded comfort belt with double tongue steel roller buckle. Totally versatile-all parts removable and interchangeable. Features 35 pockets for organizing tools; impact resistant molded base protects and allows backpack to stand up; 1680 ballistic material; load-bearing harness - padded and breathable for all day comfort; laptop sleeve holds laptops up to 15.6"; bulk pocket - quick access to bulks items such as fish tapes and power tools; attachment strap - allows bag to be easily and securely attached to vertical handles. Heavy-duty 1680d poly material; LoadBear stretch suspension for comfort; speed square pocket; adjustable velcro pouches; steel buckle belt with monster grommets; fits waists up to 52". Tech Gear Lighted Back Pack, 13 in Length, 16 in Width, 8 in Depth, Zippered Closure, Polyester, 53 Pockets, Padded Web Handle Features an impact resistant molded base that fully integrates with all PACKOUT? system components. Constructed with 1680D ballistic material and all metal hardware. Designed for ulitmate durability while the included padded shoulder strap and durable over molded handle allows for easy transport. Made of 1680 heavy-duty poly fabric. LoadBear? stretch suspension for comfort. Infinity belt fits up to a 52 in. waist. Barrel-bottom, super capacity pouches. Reinforced pouch bottoms. Adjustable pouch and rigging system. Speed square pocket. Dual hammer loops. Steel buckle and monster grommets. Cell phone pocket fits up to an iPhone? 6. Adjustable chest strap buckle. Made of 1680 heavy-duty poly fabric. LoadBear? stretch suspension for comfort. Infinity belt fits up to a 52 in. waist. Barrel-bottom, super capacity pouches. Reinforced pouch bottoms. Adjustable pouch and rigging system. Speed square pocket. Dual hammer loops. Steel buckle and monster grommets. Cell phone pocket fits up to an iPhone? 6. Adjustable chest strap buckle. Heavy-duty 1680d 2-Ply poly material; LoadBear stretch suspension for comfort; large capacity pouches; speed square pocket; adjustable velcro pouches; steel buckle belt with monster grommets; fits waists up to 52". Designed for ultimate durability, protection and storage. The backpack has the most durable hard molded base on the market with up to 5x better durability than the competition. Constructed of 1680D Ballistic Material and with rugged metal zippers, the backpack provides unmatched durability. With 48 total pockets including 2 hard-shell pockets that are designed to protect electronics and equipment from impact, the backpack provides exceptional organization. The padded and breathable load-bearing harness evenly distributes the weight for unsurpassed comfort and jobsite performance with up to 2x more padding than competitive units. 1680 heavy-duty poly fabric. Tech compartment in back fits up to 13 in. laptop. Tablet compartment in front. Dual handles allow handling as a work station. Adjustable sling strap works on either shoulder. Crafted from super tough, ballistic poly and top grain leather. Easy carry handle design provides simple adjustments, easy carrying and storage of combo without spilling contents. 8 main reversed nail/tool pockets, 17 smaller pockets fit pliers, nail sets, pencils, knife, etc, Leather combination square and pry bar holders. 5" wide padded comfort belt with double tongue steel roller buckle. Made of ballistic polyester fabric. Enough interior panels to hold a multitude of tools including: 14 pc wrench sets, electric drills, extensions cords, pliers, screwdrivers and much more. 7" x 5" Multi-compartment plastic tray included. 13"W x 17-1/2"H x 9"D.
Features an impact resistant molded base that fully integrates with all PACKOUT? system components. Constructed with 1680D ballistic material and all metal hardware. Designed for ulitmate durability while the included padded shoulder strap and durable over molded handle allows for easy transport. Made of super heavy-duty ballistic nylon; "LoadBear" stretch suspension; infinity belt fits up to 52"; single body construction (no joints to fail); barrel bottom pouches for extra capacity. Easy carry handle design provides simple adjustments, carrying and storage of combo without spilling contents. 5 main reversed nail/tool pockets. 10 smaller pockets fit pliers, nail sets, pencils, knife, etc. Leather holder fits up to 30' measuring tape. Leather combination square and pry bar holders. 2-3/4" wide heavy leather belt with double tongue steel roller buckle. Extra-strength rivets with washers at key stress points. Fits waist sizes 29"-46"
USB charging battery dock simultaneously charges 2 devices via USB ports. Maximum 2 amps shared output. 3 internal charging wall pockets can hold a tablet, phone and/or camera and can charge 2 devices through a USB connection to a 20V MAX Lithium battery pack. Low battery cut-off protection monitors battery voltage to avoid battery over-depletion. Integrated 2-level LED light system allows adjustment for wide area illumination or close-up work. Multiple interior panels hold a multitude of tools and accessories like drills, extension cords, pliers, screwdrivers, wrench sets, drill bits, testers and much more. 31 multi-use pockets inside and 2 outside help organize a wide variety of hand tools. 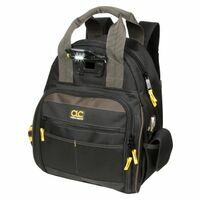 Padded web carrying handles and adjustable shoulder straps make carrying more comfortable and convenient. Large pads on back for extra comfort makes carrying heavier loads more comfortable on stress areas of the back. Easy double-pull, heavy-duty zipper. Base pad feet helps reduce wear and abrasion. Maximum initial battery voltage (measured without a workload) is 20 volts. Nominal voltage is 18. Made of 1680 denier poly material. Signature "Dead On" skull molded front pocket. Durable molded handle. Multiple front anchors for clip on carabiners. Main tool compartment: 19 pockets / holds drill / drill bit organizer. Front tool compartment: 7 pockets holds up to 8 in. screwdrivers. Rear tech compartment: 3 pockets / holds 17 in. laptop / tablet / files. Breathable straps with moisture-wicking lining on back to manage perspiration. Small front pocket & side cargo pockets. Cell phone holder fits up to iPhone? 6 Plus. Holds up to 50 lbs. Overall size: 20 in. x 17 in. x 10 in. Features 6" All-Terrain metal rim wheels; industry's strongest extendable handle; all metal skid plates; full length metal axle; 200 lbs weight capacity; wide grip handle; fold down front panel; 1680D ballistic material construction; integrated tablet sleeve; 66 total pockets.